Recent archeological investigations have shown that stoneware pottery was produced in Trenton in colonial times, one of the few known sites for this activity. Read more about James Rhodes and his Trenton pottery that was the subject of a 2013 exhibit at the Museum. For more than 100 years, Trenton, New Jersey was one of the two major pottery centers in the United States, the other being located at East Liverpool, Ohio. In 1850, the only pottery in Trenton was a small redware pottery operated by the McCully family. The development of a major industry in Trenton started with the opening of two potteries in 1853. Taylor and Speeler began production of a line of Rockingham in May 1853. It was followed shortly thereafter by William Young & Co. William Young, together with his sons and Richard Millington and John Astbury were associated in this endeavor for about six years. These two companies formed the nucleus of a rapidly expanding industry. Within ten years, there were ten potteries in Trenton. This number grew to fifteen by 1870 and reached 23 in 1883. At its zenith in the 1920’s, Trenton had more than fifty potteries operating throughout the City. Since 1850, more than 150 companies have operated in Trenton. There has never been a comprehensive history of Trenton potteries largely because of the massive scale of the industry. It is ironic that Trenton’s success as a pottery center has made it difficult to chronicle this history. As a pottery center, Trenton made innumerable contributions to the development of the pottery industry in America. Trenton is responsible for the introduction of wide scale production of white graniteware. This product enabled American potters to compete successfully with foreign producers, particularly the English. The production of sanitary ware originated in Trenton and greatly assisted the growth of the American pottery industry. Trenton also pioneered the development of art porcelain through the introduction in 1882 of “Belleek” china. Using techniques developed at the Irish Belleek works, Trenton became the base for high quality art porcelains. William Young & Co. – This company started in 1853. It was headed by William Young. Mr. Young led a small group of potters from Charles Cartlidge in New York to Trenton. The Young family operated the pottery until 1879 when the family sold the pottery to the Willets. This pottery pioneered the Introduction of white ware into Trenton, a product that enabled Trenton to become the primary center for the production of white ware in America. The firm specialized in commercial products such as door hardware and industrial products as well as an extensive line of white graniteware. Taylor and Speeler – James Taylor previously had been associated with Harker & Taylor in East Liverpool. His firm was the first to start Trenton operations in May 1853. It concentrated initially on Rockingham (Brownware) products. It also followed Young’s lead in the development of white ware. From 1855 to 1859, it operated under the name of Speeler, Taylor & Bloor. The three partners separated in 1859 and 1860. The pottery continued to be operated as the Trenton Pottery Company by Taylor until he retired in 1875. Isaac Davis became the senior member of the firm in 1875 and continued operations until 1888. The company was known for a variety of household pottery products including decorative art ware. It was a major exhibitor at the 1876 Centennial in Philadelphia. Millington, Astbury and Poulson (Maddock, Co.) – Millington and Astbury were partners with Young from 1853 to 1859. They first opened their own pottery in 1860 using this name. It is famous for its Colonel Ellsworth pitcher, a Civil War commemorative piece produced in June 1861 to memorialize the death of Colonel Ellsworth, reputedly the first casualty of the Civil War. Thomas Maddock became a partner in 1873. Maddock was instrumental in pioneering the development of sanitary ware in America. He became the sole owner of this pottery in 1878 following the retirement of Millington and the death of Astbury. The Maddock Company was one of the largest pottery producers for more than 50 years. In addition to sanitary ware it produced an extensive line of decorative ware at its Lamberton Works located on the D&R Canal at Labor Street. The company remained in existence until it was sold in 1929. Maddock sold the Lamberton plant to the Scammell family in the 1920’s. Scammell Pottery, until it closed in the 1950’s, was well known for its custom designed restaurant and hotel China and B&O R.R. Centennial China. Read more about the Maddock pottery that was featured in a 2014 Exhibit at the Museum. Greenwood Pottery and China Co. – This pottery was established in 1862 by William Tams, an experienced potter from Staffordshire, England, who went into business with several Trenton investors. It was one of the largest producers of household and hotel china and remained in existence for more than 70 years. For a short period of time in the 1880’s, it produced high quality art porcelain similar to Royal Worcester known as Ne Plus Ultra. The Glasgow Pottery – John Moses in 1863 established this pottery which quickly became one of the largest and most successful in Trenton. For the Centennial celebrations, Glasgow produced a variety of commemorative teacups and saucers for which it is well known. Many organizations sponsored fund raising activities centered on the 100th anniversary of the Boston Tea Party that featured Glasgow cups and saucers. The pottery continued in operation until shortly after the death of Moses in 1902 at which time the plant was acquired by the Maddock Company. The introduction of Belleek ware, a thin porcelain body, into the American market was one of the most significant contributions of the Trenton pottery industry. Production of this product was centered in Trenton although other potteries in Ohio and Baltimore, Maryland also produced a small quantity of this delicate porcelain. See examples featured in an 2009 exhibition of the “First Flowering” of American Beleek in Trenton. Ott and Brewer – This company was founded in 1863 by William Bloor following earlier efforts in Trenton and East Liverpool. In 1865, it was known as Bloor, Ott & Brewer. Bloor remained the senior member of the firm until 1871. Upon his departure, the firm ‘was renamed Ott & Brewer with John Hart Brewer controlling the artistic future of the company. Brewer employed Isaac Broome, an outstanding 19th Century American ceramic sculptor to produce a line of Parian ware for the American Centennial in 1876. Broome’s works at Ott and Brewer are among the most famous ceramic pieces ever produced in this country- He was the creator of the Baseball Vase and an award winning bust of Cleopatra, as well as numerous other works of parian. Ott and Brewer also pioneered the introduction and development of Belleek into the United States. Between 1882 and 1892, Ott and Brewer created some of this nation’s most outstanding art porcelain. It served as a training ground for many individuals who went on to produce art porcelain at other potteries. Willets Manufacturing Co. – As a successor to the Young Pottery, the Willets Brothers initially limited production to white ware pottery. In the mid-1880’s, they hired key personnel from Ott and Brewer to develop their own line of Belleek products. Walter Scott Lenox, who trained at Ott and Brewer, became head of the Belleek operation and developed an extensive array of Belleek pieces. Belleek was produced at Willets from 1887 through 1909. The successor company, the New Jersey China Pottery Co., continued to produce “Willets” Belleek until at least 1914. In addition to factory decorated pieces, Willets sold an extensive line of undecorated ware to individuals and groups involved in China painting. Ceramic Art Company (Lenox) – In 1889, Walter Scott Lenox left Willets and went into partnership with Jonathan Coxon, superintendent of Ott & Brewer, and founded the Ceramic Art Company (CAC). This partnership lasted until the spring of 1896 when Coxon sold his interest to Lenox. The company continued as the Ceramic Art Company with the word “Lenox” added beneath the CAC mark. In February 1906, the name of the company was changed to Lenox, Inc. It Is one of the few Trenton potteries from the 19th century that has survived to the present. Lenox offered custom decorated pieces produced by a group of talented artists. The quality of the artist-decorated pieces created during this early period has never been exceeded by any other American pottery. An extensive variety of undecorated shapes were also produced by CAC and Lenox, which were used by professional and amateur China decorators. It is internationally renowned for its dinnerware and is the China of choice for the White House. Rittenhouse and Evans (American Art China Co.) – This small pottery was established in 1891. It produced fine Belleek ware with an exceptionally white base. Difficult economic conditions led to the failure of this company by the end of 1894. Belleek pieces produced by this company are extremely rare. Morris & Willmore (Columbia Art Pottery Co.) – In 1892, William T. Morris and Francis Willmore, who had previously worked at Royal Worcester and Ott and Brewer, opened their own pottery. They were among the most talented individuals who produced Belleek products. The company also produced a line of decorated white ware. The partnership lasted for about ten years. Morris & Willmore produced porcelain of outstanding quality. Because of limited production, examples of their work are rare. Perlee Incorporated – This company entered the Belleek market in the 1920’s producing a line of quality dinner and decorative ware. The onset of the Great Depression in 1929 unfortunately brought an early end to the pottery. Coxon & Thompson Pottery (Trenton Potteries Co.) – In 1863, Charles Coxon, one of the important designers and modelers of the nineteenth century, opened his own pottery in partnership with John F. Thompson. Coxon died in 1868. The family continued to operated the pottery until its was acquired by Alpaugh & McGowan in 1883. The pottery continued as the Empire Pottery. In 1892, it joined with five other potteries (Crescent, Delaware, Empire, Ideal and Equitable) to create the Trenton Potteries Company conglomerate. The combined companies concentrated on sanitary ware but also marketed a line of decorative vases and figures. In 1904, an invitation came from St. Louis to create something special for the Louisiana Purchase Exposition, Trenton Potteries answered the call, creating four ornamental vases, each standing four feet seven inches tall, with the express purpose of showing off the heights America had reached in pottery and to highlight Trenton’s pottery industry in particular. Read more about the Trenton Museum Society’s purchase of one of the four – the long-missing Woodland Vase. One of the six companies that became the Trenton Potteries Company was the Enterprise Pottery founded in 1880 in a factory built along the Delaware and Raritan canal, part of which is still standing. It is the only Trenton Potteries factory building to survive. Read more about the pottery in a report on a NJ Department of Transportation funded archeological dig conducted by Hunter Research when an exit ramp from US 1 was built next to the factory site. The Trenton Potteries Company was acquired by the Crane Company in the 1920’s but continued operation under its own name until 1969 when the Trenton operations were closed. The Mercer Pottery – This well regarded Trenton pottery was founded in the 1860’s. For many years it was owned by James Moses, whose brother John owned the Glasgow Pottery. It produced pottery dinnerware and decorative pieces. Dale & Davis (Prospect Hill Pottery) – The Prospect Hill pottery was established by James Jeffrey Dale and Thomas Davis in 1880. It operated for more than ten years but eventually was acquired by the Cook Pottery Company. Cook Pottery Company – Charles H. Cook purchased the Ott & Brewer Pottery in 1894. It also conducted pottery operations at the site of the Dale & Davis plant on Prospect Street. For a time, it produced Belleek products using Ott & Brewer molds. One of its best known pieces was a Spanish American pitcher honoring Admiral Dewey. The Cook company closed during the Great Depression. Fulper Pottery Co. (Stangl Pottery) Fulper pottery is identified with Flemington, New Jersey where it was located for more than 100 years. In the late 1920’s, Fulper also acquired the Anchor Pottery on East New York Avenue in Trenton. It moved its entire pottery production to that site after a fire at the Flemington plant. Fulper is well known for its production of art pottery. In 1929 or 1930, Fulper was purchased by Martin Stangl, who had been Fulper’s superintendent of the pottery. Stangl pottery produced a distinctive line of colorful earthenware at this site until the pottery was sold to Wheaton Glass in the middle 1970’s. Read more about the Fulper and Stangl potteries that were featured in a 2009 exhibit at the Museum. A 1904 book on the marks used by Trenton Potteries can be found on the Trenton Historical Society website here. Virtually every form of ceramics was produced In Trenton. This included sanitary ware, electrical and commercial products and the production of decorative tiles. 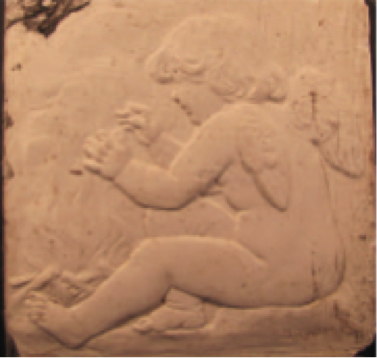 Read more about the development of the art tile industry in the United States and Isaac Broome’s contribution to it in Trenton in a version of a presentation given by Michael Padwee at the 2014 Potteries of Trenton Society Symposium. Trent Tile C o. (Wenczel Tile) – One of the earliest tile manufacturing companies in Trenton was Trent Tile Co. This company started in the early 1880’s and closed in 1938. At the outset, Isaac Broome was chief designer for the tile company. The Wenczel Tile Company continued in its East Trenton location until it closed operations several years ago. Read more about a collection of Trent Tile molds that was discovered during a building renovation and that were exhibited at the Museum in 2012. Providential Tile Co. – In 1886 the Providential Tile Co. opened. It Is not known whether Isaac Broome encouraged the establishment of this competing pottery but Broome also designed tiles for Providential as early as 1886. Providential closed in 1913. Mueller Mosaic Company – In 1908, Herrnan Carl Mueller opened the Mueller Mosaic Company at the former location of the Artistic Porcelain Company on Chambers Street and Cedar Lane in Trenton. Under Mueller’s leadership, the Mueller Mosaic Company produced tiles for many important buildings and structures throughout the Country. Mueller Tiles adorned many subway stations in the New York City subway system-n. In Trenton, Mueller furnished tiles for the Crescent Temple and the Kelsey Memorial Building at West State and Willow Streets. Many people remember the colorful tile designs at the Rotolactor of the Walker-Gordon Dairy in Plainsboro. The Mueller Company ceased operations with the death of Mr. Mueller in 1941. The number of potteries in Trenton was substantially reduced after 1920. Read more about the decline of the Trenton Pottery industry after a strike in 1923 and a conviction for price-fixing in violation of the Sherman anti-trust act in 1927 (US v Trenton Potteries) in the Trentonian’s website, A Capital Century. Cybis Studios – Boleslaw and Marja Cybis established the Cybis studio in 1942. This company produced outstanding examples of art porcelain in Trenton for more than 55 years. Examples of their work can be found in important collections and museums throughout the country and the world. Read about Rose Barclay, a Cybis decorator whose work was featured in a 2012 exhibit at the Museum. Boehm Studios – In 1950 Edward Marshall Boehm and his wife Helen Boehm opened their porcelain atelier. Edward Boehm died in 1969 by Helen Boehm continued the work begun by her husband and expanded the company to one of the best known porcelain manufacturers in the country. For many years the United States gave Boehm porcelains as gifts to foreign dignitaries as an example of the best in American artistic endeavors. President Nixon gave the magnificent “Mute Swan” figures to the Republic of China when he normalized relations with China. 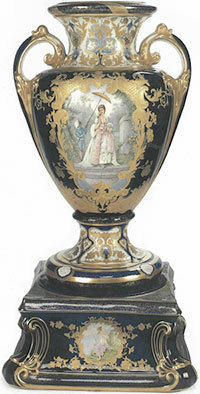 Boehm porcelain can be found in many important museums around the world. Laszlo Ispanky – Ispanky created many outstanding sculptures and artistic porcelains that were carried by many high end retail stores. The company no longer is in operation and many of his original works were sold at auction several years ago. The Trenton Museum Society has permanent display galleries on the Trenton Potteries on the second floor at Ellarslie, The Trenton City Museum. Although there is an extensive history about this industry, much information about Trenton’s potteries has not been preserved in public archives. The Society actively seeks additional information about the potteries, including catalogs, letterheads and other useful information. The Society also welcomes additions to its present collection. Individuals having information or considering possible donations of pottery and porcelain may contact the Society at P.O. Box 1034, Trenton, New Jersey 08606, tms@ellarslie.org or at (609) 989-1191.